today, i’m officially moving this blog over to lemonlimekids.com. i’m excited for my blog and website to be all in one place, and in celebration – i’m mailing everyone who comments on the new site a special treat! comment, click, and wait by your mailbox! the old site will be live until friday – so be sure to change your subscription now. i began this blog in april of 2009, as a place to share my thoughts on children’s ministry, and encourage leaders to lead well. and over the last year, i’ve been consistently overwhelmed at the amazing community of readers who shape and encourage not only each other, but me as well. on some of the hardest days in ministry, i’ve come here to be reminded that i’m not alone – and i hope the same has been true for you, too! there were a couple reasons that i wanted to move everything over to lemonlimekids.com. specifically for the last year, the blog and my main consulting website have been in 2 different places and that’s no good. i also wanted to add a few new features, that you’ll be seeing in the next couple of months. i’m really looking forward to hosting a few webinars, and streaming a great new volunteer training event, and continuing to add new opportunities for the blog to be a place for community and dialogue. 1. consulting is my business: it’s still a crazy dream to me, but people actually pay me to coach, train, consult, and advise them. and the reason i love my job so much is because i really love shepherding and coming alongside children’s ministry leaders. and often, i meet leaders for coffee, or send advice via email, or chat on the phone, or write articles for no cost. why? because i love it. and, i only want to do more of that. revenue from ads allows me time and energy to continue encouraging children’s ministry leaders. 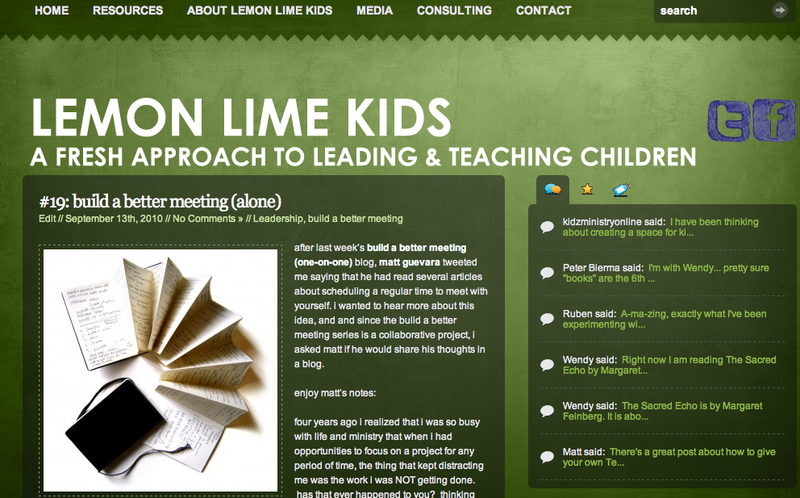 so, goodbye lemonlimekids.wordpress.com & hello lemonlimekids.com. see you there! Safe moving, Amy! I’ll bookmark the other site right now. I have subscribed to your blog and am looking forward to some interesting exchanges.